Research in photonics at the College of Optical Sciences ranges in scope from fundamentally new tools, such as small-footprint, high-throughput multiphoton microscopes, through exceptionally high-power semiconductor lasers, to components and systems for next-generation optical networks for both the Internet and data centers, and into consumer equipment like 3-D displays. New areas are constantly explored by our nine faculty in the specialty, as photonics becomes more pervasive in our lives. Communications, displays, medicine, manufacturing and imaging are just a few applications. The re-writable hologram of Albert Einstein shown as a 2-D figure was created with state-of-the-art technology developed by our group. Professor Masud Mansuripur, the college's Chair of Optical Data Storage, recently has provoked considerable controversy by reminding the physics community that the commonly used Lorentz force law for charged particle motion is not relativistically invariant when applied to magnetic materials in the presence of an electric field; the suggested remedy is to return to an alternative force law proposed by Albert Einstein in 1908. To review past updates, see the Photonics Research Updates Archive page. Judith Su's lab centers on label‐free single molecule detection using microtoroid optical resonators. The technique called FLOWER (Frequency Locked Optical Whispering Evanescent Resonator) uses frequency locking in combination with balanced detection and data processing techniques to achieve single molecule sensitivity and fast detection times. The lab's main focus is on basic research, and translational medicine through the development of miniature field portable devices as a tool to detect, understand, control, and treat various diseases. The lab is also developing chemical sensors for environmental monitoring, reducing threats, assisting national defense, and enabling clean sport competition. A screen capture of the SPIE Newsroom of Professor Masud Mansuripur. Professor Masud Mansuripur was interviewed by SPIE in February, 2017. Entitled Developing a Theory of Optical Momentum, the interview can be viewed on the SPIE Newsroom website. Schematic showing basic approach to a high efficiency solar panel. Professor Robert A. Norwood's research portfolio consists of work ranging from nanoscale electro-optic modulators to 40 square meter hybrid solar energy systems. A common theme that cuts across this 10 order of magnitude change in length scale is the coupling of fundamental optical materials and device physics to emerging applications with significant impact. The Photonic Materials and Device Lab (PMDL) is constantly seeking out new optical materials and photonic device innovations that can impact a broad range of applications, ranging from information technology, to renewable energy, to infrared optics. The ARPA-E MOSAIC program is focused on creating more efficient (> 30%) solar panels by combining standard silicon panels for diffuse light collection (labeled as 1-Sun sheet in the figure below) and high efficiency concentrated photovoltaic arrays for the direct sunlight (know as direct normal insolation or DNI). Key optical design elements include a cylindrical lens concentrator in one direction and a waveguide sheet concentrator in the other direction as shown in the schematic. This work is also done under subcontract to Sharp Laboratories of America and started in January 2016. Download Professor Norwood's research summary (PDF). 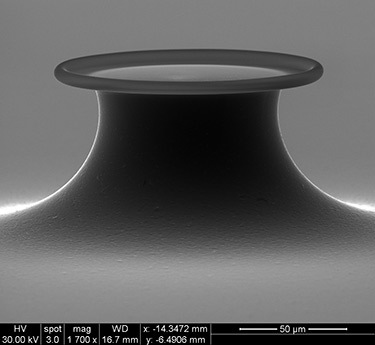 Optical tweezer apparatus for colloidal nanoparticle manipulation. Nano-photonics is the study of how light interacts with objects smaller than its wavelength. 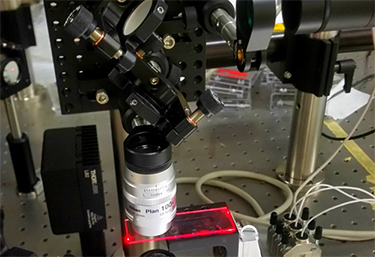 It forms the basis of some of the last decade’s revolutionary progress in photonics such as super-resolution imaging, optical cloaking, and optical biosensing. While nano-photonic devices are most often implemented in hard materials using semiconductor-processing methods, these approaches can be limited in compatibility with biological materials or complex three-dimensional designs. Assistant Professor Euan McLeod is working on developing novel nano-photonic systems from building blocks dispersed in soft colloidal materials. This approach is compatible with biological systems, and can be harnessed to fabricate three-dimensional structures. Current application areas of interest include microscopic bio-imaging, biomedical sensors, and photonic metamaterials.